Survey forms, questionnaires and long examinations are some of the traditional paper works that can consume a lot of time and effort when it comes to data checking and analysis. This dilemma can be aided by the leading windows-based processing software,Remark Office OMR. The software allows processing of your papers for evaluation through three simple steps- design, image scanning and data collection and analysis. 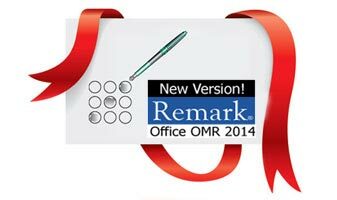 Remark Office OMR 8 has many new features. The following list provides an overview of what is new in this version. Click the to the left of any section to see the new features. • Email. An email option is available in the Remark Office OMR Data Center and Remark Quick Stats to email data and reports as attachments. You can use Remark’s built-in email client in conjunction with your SMTP server or Microsoft Outlook®. • Send Wizard.A Send wizard was added to move files via FTP or email with minimal interaction. You send data and reports from a folder on your computer or network to an FTP site or via email using your own SMTP server. You can set up profiles to be reused as needed. • Delete Images after Renaming. When using the Package and Rename feature in the Read Wizard, you may now remove the original images that were processed if desired. This will leave you with just the repackaged version of the images. • Review Exceptions for More than One Exception. If a single data cell has more than one exception (e.g., a database lookup error and a MULT), Remark Office OMR will indicate multiple exceptions were found and you can review all of the exceptions. • Logging of Changes. Changes to data sets can be logged in a password protected Access database for the ultimate in data security. • Recognition Improvements. Many improvements have been made to how your forms are recognized to help with the processing of real life situations. You can now ignore large marks, such as the X character, when someone uses it to cross out a wrong response. Remark Office OMR will also automatically compensate for brightness changes on forms (due to scanner settings or photocopying) and blank pages that are accidentally scanned. We’ve also add a new Recognition Tools feature that allows you to see the regions from the original template against the filled in form so that you can move regions appropriately when a batch of forms is badly offset or skewed. The eight character region name limit has been removed. Questions that allow multiple responses can be set up as Multiple OMR regions, not Boolean. Numeric fields that contain missing data will now use the designated missing value (e.g., -1, 99, etc.) instead of 0. The Advanced window is now available when saving data to the SPSS format so that you can customize your data file. • Saving Images with Data. You may now save images into databases as binary data along with the rest of the scanned data. • Save Data Builder. You can now customize the data saving process by including a field from your data set in the file name. This feature allows you to create meaningful data sets based on your actual data (e.g., student tests named by student or conference evaluations named by session). • Microsoft Office 2010 Support. The Access® and Excel® 2010 file formats are now supported anywhere database formats are supported. Freezing Columns/Rows. You can now freeze columns and rows in the Data Center so that when scrolling, they are always visible. TWAIN Scan Ahead. Support for TWAIN compatible scanners that use the Scan Ahead feature has been added. This feature allows your scanner to scan faster because it doesn’t wait for the computer to process the data. Auto Check for Updates. A method for checking for software updates was added to the Help menu and program preferences. Question Mean Report. This new survey tabulation report shows each question on the form, along with the minimum and maximum responses, mean and a bar chart of the mean. Student Response Report. This new test grading report shows a matrix of all the students and test questions, the answer chosen, and a color code to indicate whether it was the correct response. It provides fast insight into both student and question performance. Demographic Grade Report. This new, easy to read version of the Comparative Grade report allows you to compare up to three fields in your data in a table format (as compared to the Demographic Comparison Report that is in hierarchical format). Basic Item Analysis/Condensed Test Report. This new report for both tests and surveys provides a condensed view of all questions on the form, response frequencies and means. For test grading, it optionally shows test score information, such as min, max, and mean scores, standard deviation, prevalent non-distractors and class performance by upper and lower percentages. Detailed Item Analysis Report. Cumulative and Valid Percent statistics can be turned off in the Condensed Item Analysis report. Student Statistics Report. T-Score, Z-Score, ETS Score, and Dev. IQ have been added to the Student Statistics Report (shown optionally). Condensed Item Analysis Report. Colors have been added to the bar charts on Condensed Item Analysis report to highlight the correct answer and the distracters chosen when performing test grading. Test Item Statistics Report. Several enhancements have been made to the Test Item Statistics report to make it more readable, including: renaming Benchmark P-Value to Benchmark, changing the P-value to a straight percentage, renaming Benchmark % as Percent Correct and changing the value to a straight percentage, and adding options for each of the statistics to be shown/hidden. NA (Non Applicable) Answer Choices. If your answer choices include a non-applicable option (e.g., Strongly Agree, Agree, Neutral, Disagree, Strongly Disagree, NA) and someone chooses NA, you can exclude it from the statistics, but still be able to see how many respondents chose the NA response. Scaled Scores. The Grade Wizard supports “scaling” a score, whereby you look up grades in an external table (based on total score, percent score or percentile) and then apply the scaled score from the external file. Provides for customizable grading. Support for Multiple Versions of an Answer. You can enter various versions of an answer (e.g., .25 and ¼) and have them all treated as the correct response. Turning Off Subjective Questions Using Easy Grade. When using Easy Grade, if a subjective question is left blank or contains non-numeric data, it will be excluded from the grade operation. Screen Captures. You may now access a screen capture utility in Remark Quick Stats to capture portions of reports (e.g., graphs to place in other applications). Data Groups. When analyzing multiple data sets together, you can enter a descriptive name for each data set. That name can then be used to filter data in Remark Quick Stats, as well as on certain reports. This feature is useful for comparing data sets. Importing and Exporting of Grade Scales: You can now import and export grade scales for the purposes of sharing them via the Remark Quick Stats Preferences. Delimited Barcodes as Identifiers. If you use a barcode that contains more than one piece of data, you can now use the individual values as form, page and respondent identifiers on the form. This feature is useful for processing multiple forms types at one time that use barcodes to identify them. Image Clips and Qualitative Coding Set up in One Region. For handwriting, you can now create one Image region and apply both an image clip (snapshots of handwritten areas) and a qualitative code (a rating you supply after reading the handwriting) but maintain two separate columns in the data grid. This makes it easy to both view the handwritten comments and apply themes to them that you can view in an Item Analysis report. Remark Office OMR® the leading OMR Windows based forms-processing software package for surveys and tests. The software recognizes optical marks (bubbles and checkboxes), computer-generated characters (OCR) and barcodes. You can design your own forms using any word processor and print them on your printer. Then use Remark Office OMR to scan and recognize data with your image scanner, analyze the data in the software or export the data to the application of your choice! It's that easy!